Comments: It's okay for guys to dig shojo about ballet, right? I should just wear a pink ribbon in my hair when I read stuff like this. My first thoughts when I discovered Forbidden Dance were speckled with masculine warnings. A loud, manly siren blared in my head (as they do on warships about to blow things up) as a voice not dissimilar to James Earl Jones' told me this wasn't just shojo (a girl's manga), but in fact, this was a girly-girl's manga with frilly flowers, ballet shoes, and pinkish pinkness as far as my eyes could read. Then a cute girl walked up next to me, and said, "They have Forbidden Dance? I love this series!" I was in line after her as she bought it. So, I read it. And... I liked it. A lot. Yes, this is a story about ballet. Yes, it's probably going to have some heartrending romantic plot twists that catch you totally by surprise. However, at its core, this is a story about not giving up on what you want to do. It's about second chances that also happen to be last chances. Perhaps this manga isn't for those of us who are leading perfect lives, never having taken a path in life you wish you hadn't before. Yet, if Forbidden Dance may not be for people who've never made a mistake, then it surely should appeal to the majority of readers out there. Its draw is the true-to-life manner in which the characters behave, and while I'm certainly not an aspiring student of dance, I'd like to eventually use my degree in computer science for something more than just managing a bookstore. For me at least, Aya's story reminds me that there is still hope for following my dreams. Even in the best of times, hope can elude the most optimistic of us all. So, what's this all about? Aya, the main character of the manga, has lost her nerve to dance. She was once the top student in a highly respected ballet school, but a mistake in a major performance left her no longer willing to dance in front of others. She's almost ready to give up entirely on the art form she loves so much, but then she sees COOL. COOL, led by the enchanting dancer Akira, is an all-male ballet group that stokes the fires in Aya's soul, once more demanding her to dance. The first volume centers around her trying to earn the respect of COOL, because she wants to attempt the impossible: to become a member of the male-only group at any cost. In the competitive world of professional dancing, however, the costs may be greater than she can imagine. Artwork in Forbidden Dance is understandably character-focused. Emotion and, more importantly, empathy, both play a large part in truly being drawn into Hinako Ashihara's story. Lines are very well-defined, and screens are used to good effect for most of the shading. While I'm not the biggest fan of orange, the cover does well to inform potential buyers exactly what they're getting into when they pick up Forbidden Dance, though I'm worried that readers with an aversion to shojo may skip this enjoyable series. 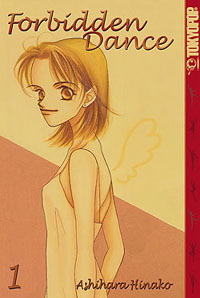 Bonus features for the manga are limited to "Ashihara's Diary," a sidebar-based journal with translated notes from the author. These are common in shojo manga tales, especially in Yu Watase's works, and they offer wonderful insight into the mind of the manga-ka. Extra material isn't exactly common in manga yet, and this feature is certainly better than other possible additions to the release. Even this early into the series, I'm hoping that Forbidden Dance will maintain this quality of content throughout its entire run. If it can, it will stand beside Kare Kano and Mars as yet another can't-miss romantic manga.